FROM THE LUAS crossing the Nine Arches bridge over the Dodder just south of the Milltown stop you can see a splendid new children’s’ playground on top of the wonderful grass slope swooping down to the tree-lined river from Columbanus Road. None of your hard cold steel frames here, but eccentric painted timber structures emerging out of mounds, all designed to safely extend young muscular skills and imaginations. And, hey, there is a “Zip Wire”! for the under twelves to whiz along! Wow! Supervising from the octagonal former Milltown Laundry chimney nearby is the resident Cormorant keeping a wary eye on his rival fisherman below, the elegant Heron. Congratulations Dun Laoghaire Co Council! The kids love it. Five years of campaigning by parents and kids in Dublin 14 has produced a massive dividend in the shape of a new playground which has just opened near Dargan's famous Nine Arches Viaduct on the banks of the Dodder near Milltown. Older Kids have been enjoying a zip wire, a giant slide and the big swing, while the littler ones love the tunnel , the see-saw and the big slide. Dun Laoghaire Rathdown Parks Department has delivered the great new play facility, in August and it makes the most of a fantastic location overlooking one of Dublin's oldest bridges across the Dodder River. DLR's new Patrick Doyle Road Playground also has great views of the Dublin Mountains and it's a great pit stop if you are walking or biking along the Dodder Walk as it is right next to a bike path that connects Milltown and Clonskeagh to Donnybrook and Rathfarnham. It is a boon for local parents too, as it is only is a short walk from the school and to local shops in Windy Arbour Village and St Galls Gardens South. It's a stone's throw from the Church of the Miraculous Medal on Bird Avenue and its quite close to Mosques at Milltown and Clonskeagh . For kids who visited the area this summer, the new Playground got top marks. "I give it ten out of ten," said Georgia, above, "it's the best playground we visited on our trip to Dublin". 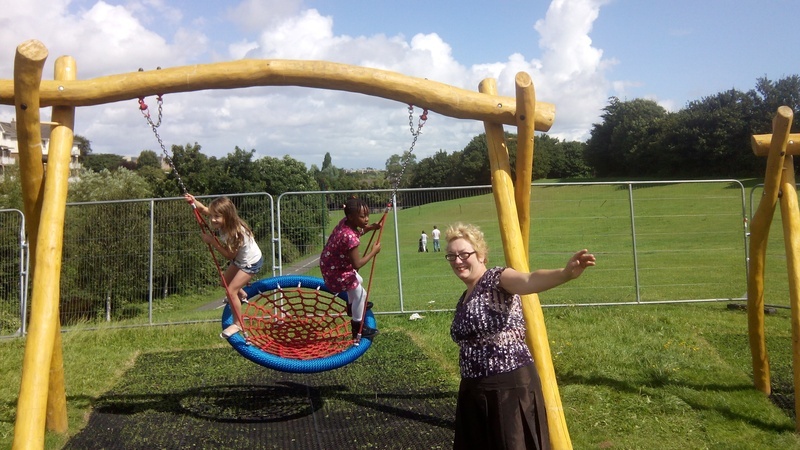 The design team deserves credit for installing unusual play equipment like the zip wire, which has proved popular with parents and kids alike and for making the most of the scenic location, by providing benches and tables for parents and childminders. It took suppliers CPCL around four months to install, and it is valued at around 100,000 euro. Contractors CPCL have been chosen and the playground is set to open soon..
What should the new playground be called? DLR is also accepting submissions to the 2016-2020 Local Area Plan and is open to the idea of building a new community centre near the playground. So have a think and get your comments in ASAP. Officers from Dun Laoghaire Rathdown Co Council have confirmed they are working towards building a new children's playgrournd on a site on Patrick Doyle Road. DLR workers in Estate Management suggested the new Patrick Doyle Road playground was likely to open by December 2014. Councillors confirmed that permision had been granted for the new playground. How do we address concerns about anti-social behaviour in playgrounds and parks? In 2012 Dublin City Council spent a lot of money revamping its play facilities. Two of our closest local playgrounds - those in Palmerston Park and Belgrave Square benefitted from this programme and play facilities there are much better for younger children as a result. However, there was quite a bit of anti-social behaviour from teenagers which caused Dublin City Council to employ a security firm to monitor activity in the Belgrave Square playground, just weeks after it was re-opened. Last year Dun Laoghaire Rathdown also opened a new pocket playground in Dun Laoghaire and DLR is also rebuilding and improving play facilities at Marlay Park. In October, Shan Kelly met some DLR Parks and Recreation Officers to discuss improvements to two green spaces in Windy Arbour Village. Playgrounds were not really on the agenda, as the meeting took place to discuss taking forward plans outlined by the Windy Arbour village Association 's Two Greens project. However, officers said that DLR does not have money available for a new playground near Windy Arbour. They also pointed out that anti-social behaviour was a concern for them. Anti-social behaviour in playgrounds remains an ongoing concern for Dublin City Council and it has responded by opening the gates to Herbert Park on a 24- hour basis, so police can inspect that park in a bid to reduce it. 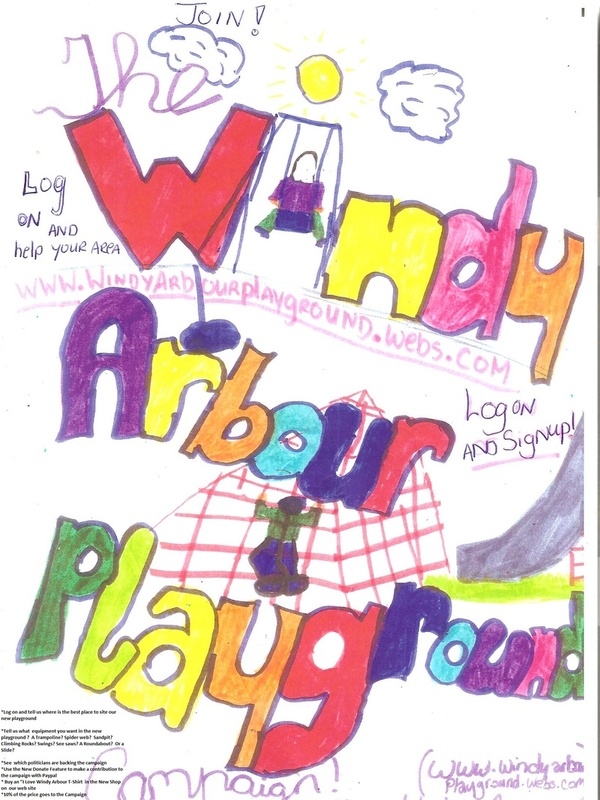 The Playground Campaign is supporting the Windy Arbour Village Association (WAVA) in its plans to make Windy Arbour Village look better by adding flowers, two name rocks and better signage telling walkers about our historic village. We're also working with Dun laoghaire County Council to develop an area action plan which we hope will include possible sites for a playground and better community facilities. There will also be a WAVA children's colouring competition this summer. You can pick up an entry form in any of the village shops that have joined WAVA. Check out the Windy Arbour Village page on Facebook . "Like" the Windy Arbour Village page if you would like to get involved in improving your community. 2011 was a really busy year for the Playground Campaign and for me, so I spent only a very little time posting updates to this web site. A bit of history - The Windy Arbour Playground Campaign started life online in Spring 2009, so this Spring we are hoping to celebrate our third birthday. To celebrateour birthday we have produced a 2012 calendar in two formats, which features some lovely photographs of wildlife along the Dodder and the Slang rivers. All of the Illustrations in the Calendars were created by members of the playground campaign. I especially want to thank our administrator Sophie Hamilton for allowing us to use the wonderful poster she created when she was just eleven. We used Sophie's colourful poster to illustrate the Month of April. Thanks also to photographer Scott Kelly, another long time supporter of the Campaign, who got up really early one morning last Spring to take the great shots of wildlife along the Dodder that make up the bulk of the photographs in the Calendar. We are also using Scott's photographs to create a series of postcards promoting Windy Arbour Village, which will be for sale in local shops. We hope you will support our first fundraising efforts, as we are hoping this year to open a Credit Union Account and form a Management Committee. The council's Green Spaces Report has acknowledged that the Dundrum area, which includes Windy Arbour badly needs children's play facilities and it has allocated more thatn 520,000 euro to improving green space and creating urban playgrounds across its five electoral areas, so we are definitely hoping DLR's parks Department will spend some money to build safe play facilites for Childen here. Last Spring we redesigned the web site and we had our first ever members meeting in The Dropping Well Pub. Following that, The campaign made a number of submissions to Dun Laoghaire County Council about its Green Spaces Report. We also began working with the businesses based in Windy Arbour to form a Windy Arbour Village Group. We had two meetings with local traders in Ryan's Pub. The first was with Hal Ledford, CEO of the Dun Laoghaire Chamber of Commerce, while the Second, in November was with Wessel Badenhorst, DLR's Economic Developement Officer. Wessell told us how businesses all across the five electoral areas that make up DLR are organising themsleves into local groups bent on maximising the money that is available from the council to improve their communites. The message from DLR to businesses is that it wants businesses to take the lead in improving their communities and it will support businesses working with active residents and community groups like ours. It's not just in Dun Laoghaire that businesses are forming local associations either. There are new groups in Terenure, Rathfarnham, Churchtown, Monkstown, Ranelagh, Foxrock, Dun Leary Town, Monkstown AND DUNDRUM. The Churchtown Business Association got funding from DLR last year which helped it to organise two events, a Summer Fun day in De la Salle School and a Christmas tree and lights switch on opposite SuperValu - Dun Leary Town had a really ambitious ice fair where Santa arrived on a Harley Davidson bike. Wessel's advice to us here in Windy Arbour was to think about what makes our village unique and to focus on ways that we can promote those unique characteristics. Many of us wanted to highlight our wonderful river walks and our long history of industries connected to our two rivers, so we have created a postcard saying Greetings from Windy Arbour, which you will soon to able buy to show your support for improving our village. We are also working with Dun Leary's Heritage Officer to put a series of signposts around the Village highlighting our history and encouraging people to walk. DLR County Council says it is very keen to work with business groups to improve the local area and it has promised to match whatever money can be raised by local trader groups to carry out improvements to the areas that come up with the best ideas fo improving trading conditions. So the Playground Campaign is working actively with traders right across Windy Arbour Village to figure out how we can improve the shoppping experience in the village. We are looking at the provision of better signage, flower baskets, car parking, landscaping, a christmas tree,and of course, we are also hoping for the provision of some children's play facilities near Windy Arbour. At our second meeting of the Windy Arbour Village Association, we elected a steering group consisting of Eva from Indulge Hairdressers, Michael from Hunters Chemists and Brid from Ryan's Arbour House and myself, Shan Kelly of the Windy Arbour Playground campaign. The Village Association is hoping to meet later this month to plan our events and activities for the year ahead, so if you have any ideas you'd like us to consider, please let us know. We are hoping it might be possible to begin by organising a car boot sale one Sunday in Ryan's pub car park. Other ideas that have been put forward were for a fun fashion competition. We are planning to contact all lolcal schools this year to ask for their support in finding ways to involve schoolchildren in the campaign. Our 2012 calendars are on sale in shops in Windy Arbour Village which are supporting this campaign. We are hoping to organise a few events this year with the Windy Arbour Village Association. Congratulations to the DLR County Council Team headed by Senior Parks officer Leslie Moore, which has produced this important strategy document identifying most of DLR’s Parks and green spaces and rating them in terms of their quantity and quality. The draft strategy document highlights the importance of parks, playgrounds and green spaces in building and maintaining sustainable communities, in encouraging biodiversity and supporting wildlife, all of which the Windy Arbour Playground Campaign agrees with. l DLR has 30 play facilities In total, aimed at children aged 0-14 years. DLR’s regional playgrounds are located in Marley Park, its one of its three Flagship Parks in the Glencullen electoral area, and in The Stillorgan and Dun Laoghaire areas. The Strategy report tell us there are almost 50,000 children living in the County and that although play provision is generally seen as good across DLR, there are significant gaps identified, notably in Windy Arbour, Clonskeagh and Milltown, where the report says play provision for teenagers, toddlers and junior children all needs to be improved as a matter of priority. The report says that Dundrum has the worst play provision in the County. It makes clear that more and better local playgrounds are needed, and Windy Arbour is highlighted as the area most in need of new children’s play facilities. Only 12.6% of the total number of parks in DLR are in the Dundrum Area has , and combined with its high population density , this means that Parks space per 1000 of population in Dundrum electoral district is the lowest in the whole Borough, at just 0.95 hectares HA per 1000 people. We believe that DLR should rectify this lack of parks and particularly play facilities by making the most of a very scarce resource, -in this case land – and two wonderful rivers – which have the potential to help regenerate the community around Windy Arbour by bringing new business, jobs and visitors to Windy Arbour, Clonskeagh and Milltown. The whole document can be downloaded at www.dlrcoco.ie/parks or you can read a copy in DLRs Dundrum office for te next week. This Draft strategy outlines DLR's plans to improve poor provision in areas like Windy Arbour by building new urban playgrounds and also by tentatively allocating funds for improving urban parkland. The draft identifies all the green spaces above 0.2 hectares within the Council’s five electoral areas and concludes that Parks and play space provision in the Dundrum area, where Windy Arbour is located, is the worst in the whole County. This compares badly with the best Parks provision in the County, which is in The Glencullen Area. Glencullen electoral area includes Marlay Park and now has very good parks provision – at 6.8 HA per 1000 people, it is much higher than the average across the whole county. Parks provision is worst in Dundrum, because the Dundrum area has no Flagship or Regional parks and only two Community parks at Ballawley and Loreto (Nutgrove), The Draft reports on some upgrading which has taken place recently at Loreto park with Residents Association’s support, which it says has resulted in improved use due to less anti social behaviour. The Draft says Play Facilities Need to be Improved in the Dundrum Area as a matter of priority. As DLR acknowledges in Section 5.54: “ Dundrum electoral area has the least provision.” This is despite residents here campaigning for many years for the replacement of children’s play facilities here. One problem is that although there is adequate community green space, much of the green space in Windy Arbour, Milltown and Clonskeagh is not formally designated as park land, and there areno park amenities like noticeboards, benches, picnic tables or bins provided to encourage formal use for play or exercise. The survey places each of DLR's 30 parks into one of three groups: Flagship; regional or Local. The Draft reports that Dundrum has eight parks sites, making up a total of 35.40 hectares or HA, but only one “Major local Park” of 2.4 HA). This seems to be Loreto Park, which is still rated as Below Average. The draft also rates the quality of DLR’s other green spaces,playgrounds and outdoor sports areas. It identifies 344 outdoor recreational facilities in the County’s five electoral areas, but notes that some are of poor quality or inaccessible by foot or public transport. The report notes on Page 41 that most outdoor play facilities are in Stillorgan (23%), followedby Dun Laoghaire, which has 22%, and Glencullen (20%). Dundrum and Blackrock with just 12.6% and 8.6%have the fewest play facilities in the County. The Draft Document suggests that the Council should allocate around 300,000 euro to local park Upgrading. If residents support this request it could mean one or more new playgrounds being built in the area overthe next four years and could result in significant improvements to local green spaces, culminating in them being upgraded to parks. This report suggests a phased approach is best. I have suggested that a significant chunk of that 300,000 eurocould be invested in making a formal park from the open land along the Rivers Dodder and Slang, between Classon’ s bridge at the Dropping Well and The Packhorse Bridge at Milltown, near the Shia Mosque. Urgent plans shouldbe made to rehabilitate the land along the banks of the Slang river, which hasbecome a dumping ground just before it flows into the Dodder near Patrick DoyleRoad. This land is overgrown, but a cleanup operation could begin immediately,with a longer term plan to build a flagship green playground on or close byit. This site is very close to Robert Emmet’s old home at Emmet House on the Dundrum Road. This plan could be developed in partnership with the educational bodies that currentlyuse the playing fields there, and in partnership with local businesses,churches and other community bodies. This would go along with best practice as outlined in the document,which suggests making the most of natural features and building on local historical contexts. Although thi is suggested as a long term plan, it would also be possible to progress toward it rapidly, by providing a small local playground, in this area, perhaps including a solar-powered fountain, to highlight the context of the river valleys and also including art works commemorating local patriot Robert Emmet, who grew up here and planned the 1803 Rebellion from Windy Arbour. trained along it to improve its visual aspect. Specifically, Table 5.13 on page 45 shows that the Dundrum area, which includes Windy Arbour and parts of Clonskeagh, Churchtownand Milltown in the North) has no regional play facility, playlot, or communityplayground. Section 5.57 on page 46 identifies under-provision of play facilities in Clonskeagh,particularly at Farranboloey, Milltown and Windy Arbour, as well as in Dundrum at Taney and Sweetmount. The draft recognise that further work is needed to plan and prioritise future play provision and it points out that at present teenagers are the group of children most badly provided for throughout the County. It advises that a Review of the Council’s current Play Policy, which was last done in 2003, is due and that these electoral areas should be prioritised when future facilities are provided. This campaign believes DLR should look at providing a good local playground to serve Clonskeagh,Milltown, Farranboley and Windy Arbour, which can be upgraded to become a regional or flagship playground later on, through the addition of a museum, waterpark and/or community centre. Table 8.1 shows the capital investment programme the Council is planning over the next four years to improve its parks and openspaces. Euro 240,000 has been allocated to urban playgrounds, with a further 300,000 allocated to local parkupgrading, while more than 8M Euro is planned for further spending on MarlayPark. Surely it would be better to spenda little more of of the 8M euro allocated to Marley on a new playground in Clonskeagh where densities are higher and the need is greater? What do you think? This week is your last chance to tell DLR what you think about this draft report and for you to influence the allocation of resources, vis a vis priorities. Section 8.4.1 commits the Council to working in partnership with local people and other organisations by engaging with Community Groups,volunteer and interest group to achieve the objectives of improving local greenspaces. The Windy Arbour Playground Campaign now has more than 25 active members and more than two hundred local residents and business people which support it. We are very keen to work with the Council’s Parks Department to build and maintain new local play facilities for the children and teenagers of Milltown, Clonskeagh, Windy Arbour, Churchtown and Dundrum. We would like to suggest DLR begins rectifying the lack of play space in Clonskeagh and WindyArbour by creating a small urban playground close to the Dodder and Slann River sites mentioned. DLR could then worktowards building an indoor community space with Internet access which could to used forplay, indoor exercise, meetings and training, later on, with the option of subsequently adding toiletfacilities, or a museum focused on local history, arts spaces and a cafe lateron. The arts element is quite important and could include signposting, sculpture and a history trail. A large Community building project like this could beundertaken in partnership with the Waterboard and Dublin City Council as there is a significant water recycling andCSO facility near the Dodder at Milltown, so it would be good to work with thewater company to ameliorate the odours produced by it, while also working onother land upgrade works, towards building a new Community Centre close toMilltown Luas, which should be linked to the shops in Windy Arbour, via a Green path network. It would also be good tocreate a green Walking trail from the Dropping Well Park, which has a FamineHistory, to Robert Emmet’s Birthplace in Clonskeagh, via the new CommunityCentre and then on to the shops and business centre in Windy Arbour via a newGreen Link over the road SkyBridge to help people cross the Dundrum Road nearRobert Emmet’s Home. We would like to help formulate a new play policy linked to the Arts and to Business and biodiversity which centres on creating a new large park around the two Rivers.We note that DLR has already started a project to improve the banks of the SlannRiver where it flows through Ballinteer. In our view, it is equally important to renovate the banks of the SlannRiver which runs through Windy Arbour, which is now overgrown and dangerous toaccess. The brownfield land behind Millmount Terrace and the Dundrum road, which backs on to Green space at Patrick Doyle Road could easily become a wonderful site for a new sports and community centre with a playground sited close by or even at roof level ( if the building was built below ground level). An imaginative architectural response to this site could provide a new community facility at the heart of a new flagship park. It is possible to work gradually towards this goal by starting with a series of small achievable goals, which should begin with identifying two sites – one for a toddlers playground and one for junior and teenage children, which should be at the heart of the new flagship local park for Dundrum which highlights the wonderful natural heritage around Windy Arbour. Hello to everyone who has joined the Campaign. We have increased our membership a lot this year, mainly thanks to the great posters designed by kids around Windy Arbour and Clonskeagh. The good news is that Dun Laoghaire County Council has a new Chairman, a Fine Gael Councilllor, who has stated that one of his priorities in this financial year is to increase the amount of money the council spends on playgrounds. DLR Co Council has already recognised that we need better play facilities for children near Windy Arbour. Now it is up to us to convince the Council to take some action. Some Campaign members are planning to meet up on one evening in September to plan our strategy going forward. One meeting place we've used already is the Dropping Well Pub. If you would like to come along to a meeting to discuss our future strategy, let me know. First or second Tuesday in the month at around 8.30pm? We hope you like our new poster. Check it out in the Photos Section above. We are also looking for volunteers to post it around the area. Contact Shan to pick up copies. I should also mention that we also have a Facebook Group now, which is called www.facebook.windyplay, Join us there if you are on Facebook. Would you like to help plan, design and build a Community Garden in Windy Arbour? If you have some ideas or free time, let me know and we can approach DLR Co Council for assistance as this is an area the Couyncil says it would like to help residents with.